Growing up in the 1950s, my musical icon was Elvis Presley. I enjoyed his songs, combed my hair the way he did, and even grew sideburns to match his. Frank Sinatra was still around and popular with my sister Martha and her friends who were five years older than me. Now in my senior years, Sinatra and his big band arrangements have re-emerged in my consciousness as musical classics that have withstood the test of time. 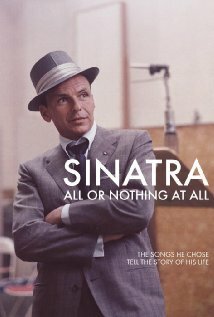 Fifty years after they were written and performed, they still sound fresh and tuneful, which is why I found the four-hour documentary of his life, Sinatra: All or Nothing at All, fascinating to watch. The main talking head in the film is Frank himself, who appears in archival footage being interviewed by Walter Cronkite and in a host of other unspecified settings. Sinatra’s story has been well documented over the years. Born in Hoboken, New Jersey, he determined at an early age that he wanted to be an entertainer. First singing in local clubs, he eventually became a featured vocalist with the Tommy Dorsey band, and soon morphed into a solo artist selling millions of records. When his career floundered for a short period of time, his professional life was invigorated by the movies. He won an Academy Award for his role as Maggio in From Here to Eternity, and from there he went on to star in a number of popular films. Furthermore, his appearances in Las Vegas gave new life to what was at that time a moribund city. Together with his celebrated “rat pack” of buddies, he injected new energy into the Las Vegas tourist industry. As I heard his rendition of his classic signature songs at his “Retirement Concert” in 1971, I became more aware of what separated him from other crooners of the time. It was his impeccable pronunciation of words and phrasing. It was a mellifluous voice, one that was able to convey nuances of deep emotion by phrasing his words in idiosyncratic ways. The documentary reveals that as a young man Sinatra took singing lessons to improve his delivery. He paid $3 a week to learn voice calisthenics to make him a better singer and it worked. His investment in learning at a tender age reaped rewards and Frank’s career blossomed. This vignette of his early voice lessons reminded me of the Talmudic concept of girsa d’yankusah, the learning that one does as a youth. The Sages tell us that such learning stays with one for the rest of one’s life because it is given when a child’s mind is a tabula rasa, a blank page upon which indelible memories are engraved. Moreover, the Talmud tells us about a great scholar who remarked that his most important teacher was the one who taught him the alef-bet, the Hebrew alphabet, which was the bedrock of all his learning as a teenager and adult. Frank Sinatra is one of the great musical icons of the twentieth century. Like all human beings, he is both talented and flawed. Sinatra: All or Nothing at All reminds us that his determination to be a musical star was not serendipitous. He worked hard to succeed and took advantage of every opportunity to move his career forward. His investment in voice lessons as a young performer indicates that Sinatra knew his weaknesses and wanted to correct them. He was not satisfied with merely being good; he wanted to be great, and he was open to receiving criticism if it helped him become a more successful entertainer. Sinatra’s retirement concert, which is the linchpin of the narrative, demonstrates through song the many challenges that he faced and his ability to survive and prosper over many years of show business. His odyssey demonstrates how an ability to accept criticism and guidance in one’s youth can create enduring and felicitous consequences in the future. Find out more information about this movie from HBO. Posted in Documentary, Movie review, Musicals. Bookmark the permalink.